Set against the backdrop of Victorian London, its famous skyline dominated by Big Ben and the Houses of Parliament, is an online pokey from prolific Australian developer Aristocrat. Given its identifiable setting, Werewolf Wild is clearly influenced by the cult 1981 film An American Werewolf in London – but you won’t find any hapless backpackers for symbols. In this game, the werewolves are actually your friends. The atmospheric setting is just one feature which serves to make the game stand out. Against a purple sky, forks of lightning strike the turreted buildings, whose windows glow and flicker against the falling dusk. The cartoonised capital city resounds with custom sound effects to create a mood of foreboding, and there are five reels on which to spin one of the 25 fixed pay-lines. The reels themselves are set on houses at twilight and symbols include gas street lamps, a dashing nobleman, a maid, a moustachioed policeman, gold coins, a Victorian horse-drawn carriage and the figure of a shadowed werewolf howling in front of an oversized full moon. Further symbols in the game include the usual 10, jack, queen and ace. The image of a werewolf’s head acts as the Wild and can replace all other symbols except the Scatter and bonus symbols. The Scatter symbol, incidentally, is represented by the aforementioned howling werewolf. Don’t worry: it’s easy to tell the two wolves apart. If you’re lucky enough to land the aforementioned gold coin on the first reel, as well as a Wild werewolf elsewhere, you will trigger the Mystery Coin bonus feature, which entitles you to a multiplier of your combined stake: the multiplier can be anywhere between 2x and 40x. Some users have reported 5x to be the most likely multiplier, but you might get lucky and hit 10x, 20x or even 40x. Incidentally, the gold coin only ever appears on the first reel. Like with many Aristocrats pokeys, triggering the bonus is where you can make some serious money. Free spins are activated when you land three, four or five Scatter symbols anywhere in the reels. Hit three of the howling wolves and you’ll get seven spins; land four and you’ll get 14; land five and you’ll receive 28. As you enjoy your free spins, watch out for the Wilds, which have a tendency to pop up alongside the character symbols. Werewolves and humans aren’t very good bedfellows, so the wolf is liable to claw the characters, thereby infecting them and turning them into werewolves. As more characters are transformed into ferocious, snarling werewolves, the chances of you winning big are increased. The highest paying symbol is the howling werewolf. Find five of these emblems on an active pay-line and you’ll see your stake multiply by 1,000. I don’t know if wooden stakes work on werewolves, but I do know the relevant stakes required to play this game. Players enjoying Werewolf Wild will need to part with one coin per pay-line. Because the maximum bet uses up 25 of them, and with coin values set at $4, it’s worth a cool $100. You can’t become a millionaire with Werewolf Wild, more’s the pity, but you do have a chance of scooping a 1,000-coin jackpot worth up to $4,000. The Werewolf Wild pokey includes a gamble option, in case you want to multiply your winnings, which you can do so fourfold. After conquering the base game, you can multiply your bet by two simply by guessing the colour of the card. Alternatively, you can quadruple your stake by answering the suit of the card correctly. It’s a risky proposition, but potentially lucrative. And players get to voluntarily choose whether to take advantage of the option before spinning the game. Five gambles are your limit, but the chance of achieving five successful gambles are – naturally – extremely slim. Werewolf Wild is a relatively basic game, but it’s a lot of fun nonetheless. The 2D graphics aren’t for everyone, but if you can suspend your cynicism for a hot minute, you’ll probably find the gameplay endearing. And because there are several ways to trigger bonuses and free spins, you can watch your winnings snowball very quickly. 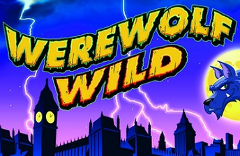 At the moment, Werewolf Wild is not available in land-based casinos, however the online version is compatible with both Mac and Windows computers and available at many online casinos. Give it a whirl and see what you think.